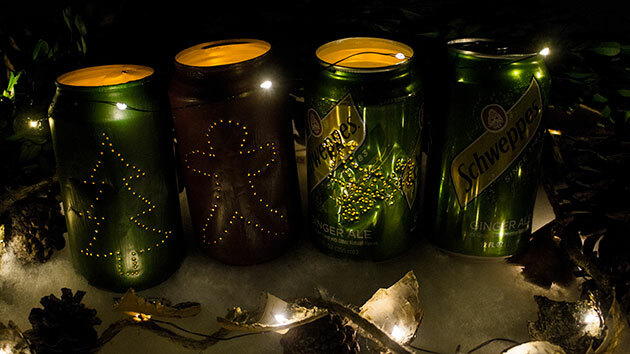 Upcycle your Schweppes® Ginger Ale cans and 2-Liter bottles into seasonal décor. Holidays are best observed with family and friends, exchanging time as well as gifts. Regardless of how or with whom you celebrate, though, you can make memories while making these DIY winter wonderland decorations. 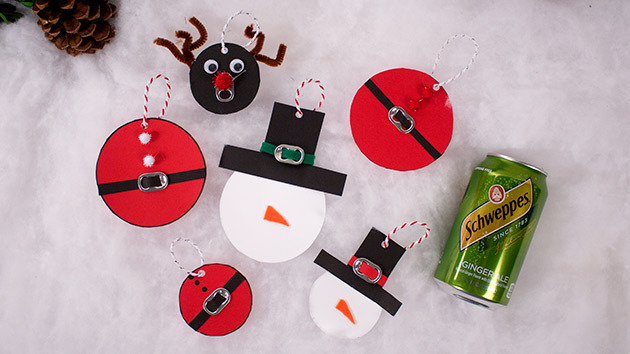 Add a little sparkle to the season with this easy can craft. Place some outside for a decorative walkway or around reflective objects for a truly magical setting. Find an existing holiday pattern or draw your own on a piece of paper. 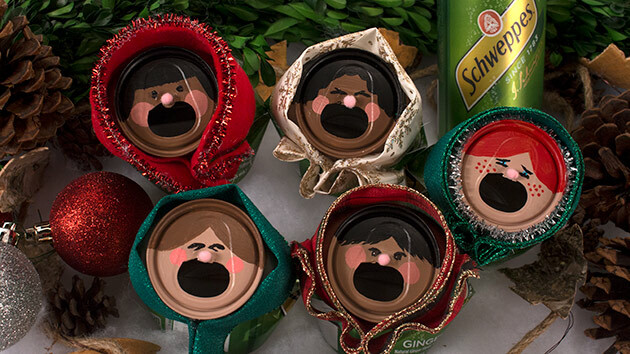 Tape the design to an empty Schweppes® Ginger Ale can. Use a thumbtack to outline your pattern with tiny holes. Paint the outside of your can with the color of your choice — or leave unpainted for some classic Schweppervescence nostalgia. Once dry, remove the top with a can opener (gently, so you don’t crush your artwork). Place the tea light inside the can and watch it illuminate the night! Fa-la-la-la-llow these instructions for a fun family project anyone “can” do. 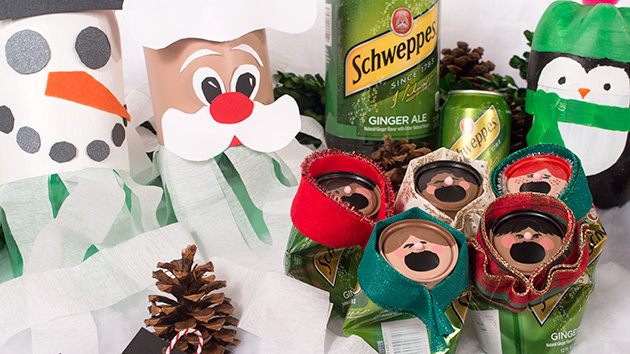 Remove the tab from the top of your Schweppes® Ginger Ale cans. Squeeze the middle of your can so it partially folds over, with the top leaning forward. 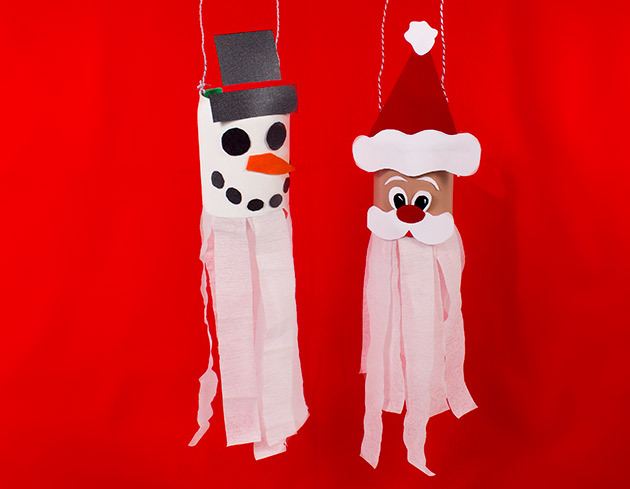 Add fabric and ribbon as clothing for some cozy carolers. Additional tip: Rather than “folding over” your cans, you can also crush them flat. Create three or more carolers and you’ve got an ensemble! What’s cuter than a penguin in a scarf and hat? How about a huddle of them! Cover both bottoms in white paint, as a primer. Once dry, combine the two bottle bottoms at the cut ends (use the shorter one, if possible, as the top); glue together, if necessary. Paint the body of the penguins in black, leaving the face and front of the body white. Paint the hat and scarf in whatever color you choose. Add eyes with black paint and a beak with orange paint. Then, complete your chicklet by gluing a pom pom on top of the hat. Additional tip: Use a thin brush and lightly add white paint to the scarf and hat to create texture or patterns. Add these personalized tags to gifts and you may need to stop your recipients from marveling so they can get to unwrapping. Cut your red stock paper into a circle for the body. Cut a black strip of stock paper and pull it through the soda tab to create a belt. Glue the belt onto the red stock paper. For the buttons: Place two dabs of glue above the belt buckle and add cotton balls. Punch a hole in the top and add twine to complete your tags! Additional tip: Feel free to get creative and try different shapes or characters. You may also want to recycle the unused tabs from your Can-dle Lanterns to make these. Streamers and a little winter breeze really make these guys come to life! 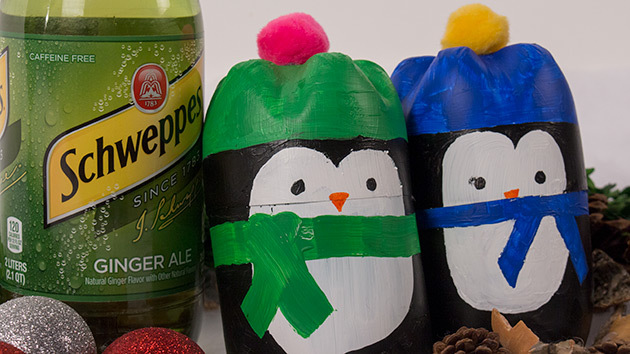 Outline and cut your 2-liter bottle into any winter wonderland character or pattern you like. Paint your design and add stock paper for features. Add streamers at the bottom. Hang your craft outside or on the front porch to share the joy with neighbors. SCHWEPPES and J. SCHWPPE Signature are registered trademarks of Dr Pepper/Seven Up, Inc. ©2017 Dr Pepper/Seven Up, Inc.
© 2017 Dollar General. All rights reserved. Neither Triad Digital Media, LLC d/b/a Triad Retail Media nor its publisher make any representations as to the accuracy or efficacy of the information provided. Special written permission is required to reproduce in any manner, in whole or in part.